B-Side: Can Homewood Flossmoor Pass The Test At Arcadia? The outdoor season has arrived! The Texas and Florida Relays was last weekend. This time the high stakes will be the Arcadia Invitational in sunny California. 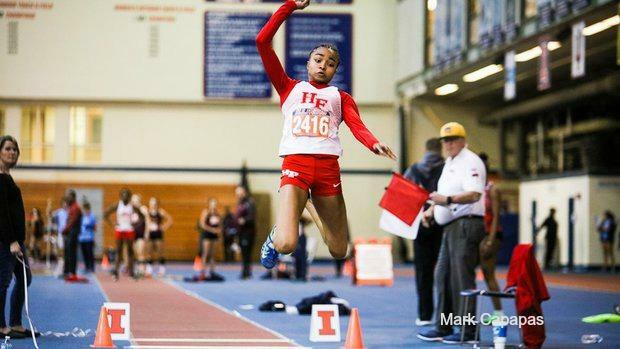 The top girl's team that will represent us is Homewood Flossmoor. Can we get a repeat of New Balance and do what E. St.Louis Sr. did? They no doubt will not be taking a quiz, but a test. They have looked good, almost dominant this past indoor season. But this is different, this is Arcadia. They have carried themselves with a championship swag all season. But that' easy to do when a lot of teams don't match up or are intimidated. The competition at this meet will not be intimidated. They will have to come with the same energy they've had and more. Coach Zontavius Johnson (Coach Z) warned me at the first club meet before Christmas that this group would be special. And he has yet to back off his feelings. There is even been mention of tugging on the coat of the great teams of Lincoln-Way East, maybe even pulling the coat completely off. As Biggie wrote in his cut "Dead Wrong", 'Smack the __ in the face, take her Gucci bag and the North Face off her back.' These without question are lofty expectations. Are they ready? We know the weather hasn't been too kind as far as getting a lot of handoff practice. And have they truly adjusted from indoor to outdoor/ Do they really have enough speed? Or is this a collection of four solid women? Are they mentally tough enough or are they questioning themselves? The last couple of meets HF has not been pleased. Top Times was a little closer than expected as Kenwood continues to lay in the weeds and breathe on their necks in the 4x200. The Belleville West Invitational was last weekend. The Lady Vikings won the 4x100 over Kenwood 48.17 to 48.29. But the wake-up call was in the 4x2. Carbondale, WHO? Carbondale won it in 1:43.60. They came in with a ringing alarm clock and woke up the state. It reminded me of how my mom came in my room the day after I graduated from college and clicked the lights on in the early morning saying, "Go get a job!" It was loud and irritating. The word on the street is HF has been irate all week from the loss. Did Carbondale wake up a new more focused and determined HF? Or are they shook? What better way to silence the doubters than to win an Arcadia title. The one thing we know about sports is when a team wins a lot, things that really are problems are overlooked. But when a loss comes, everything that was wrong the whole time comes to light. All of a sudden things are noticed more. HF will need to come together as a tight camp if this has happened to them. The HF Invitational 4x1 plate is as full as your first plate on Thanksgiving Day dinner. They will face the top three teams from California, who were all at the Texas Relays where all the real smoke took place last week. Calabasas ran 46.28, Scripps Ranch is at 46.95, and the famed Long Beach Poly rolls in at 47.02. If that isn't enough competition for you. HF will have Bullis (MD). Yes, that Bullis is in the field. And they've been angrier longer than HF after what happened at New Balance Indoor. HF comes in with an IL #1 48.17. The rated 4x2 HF looks to have a real shot as they're in lane 4. I've written in the past that meets like this are at a different level than what you face in your state. And you simply can't prepare for it. HF must come in with swag and be determined to shock the world. Hey, nobody saw ESTL coming at New Balance. It will be their test of the season. The experience of Arcadia could put them at a whole new level, a national level.